Does the thought of delivering a public speech and forgetting your lines terrify you? Fear not! The following talk is from Day 13 of Ron White's renowned Memory in a Month program. As a result, his references to the 'Guide Book' and to earlier sessions won't make much sense. 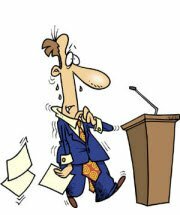 According to a survey that came out a few years ago, the number one fear in America is the fear of public speaking. The number two fear on that survey was the fear of death. Can you believe that?!! People are terrified of giving a speech. However, when you can give a speech without notes, it builds your credibility, your self-esteem, you're able to maintain eye contact, and the people you are talking to are impressed with your knowledge of your subject matter. They will notice when you aren’t using notes. I instruct our live two-day seminars and I never access a single note. That is seven hours each day and 14 hours total, and I never use a single note. Well, actually I'm using notes, I'm just the only one that can see my notes. To instruct our seminars, I take my notes and I then file them to my house files. I do not memorize my speech word for word. Imagine how boring that would be to listen to a speech that had been memorized word for word. Instead, I just filed the major thoughts to my files and then jump from one file to the next in my mind. If you are called upon to give a speech, it will be most likely on a subject that you're familiar with. So you will not need to recall it word for word. Instead, you'll use brain triggers to move from one file to the next. Let me show you what I mean. I'm going to give you 10 pictures and then file these pictures to your house files. You are only going to use your first two rooms, because I'm going to give you 10 pictures. These 10 pictures are actually 10 items from a speech given on Time Management. Remember, we are going to use our house files. So sit back, relax, close your eyes, or think house files. Okay, number one, what is your file? Got it? File a clock to number one. Vividly see the clock. Is it a grandfather clock? An alarm clock? See it, make action in the picture. File a clock to number one. Number two, what is your file? Got it? What is your file for number two? File an organizer or day timer to number two. Maybe it has arms and legs. Number two, a day timer or organizer. If you saw it, you would never forget it, so see it. Concentrate on that one, stop the program if you have to. Number three, what is your file? If you need to stop the program, like I said, in between each one to get a strong picture, that’s fine. If you can go straight through, even better. Number three, what is your file? File a things-to-do list to your number three file. Vividly see it. Again, file a things-to-do list to your number three file. Got it? Okay. Review number one, number two, and number three. Number four, what is your file? File a goal post to number four. What is your file? Got it? File a goal post, like a football field, to number four. Clearly see it. File a goal post. Concentrate, see that, a goal post. Don’t just say it, see it. Number five, what is your file? Got it? File a cargo ship importing ants, like fire ants. They get all stingy. That’s right, importing ants. That is quite a picture, isn’t it? File a ship-importing ants to your number five file. Go back and review four, three, two, and one. Now, we are in the second room in the first file. What is your file? This is actually number six. What is your file? Got it? File a blackjack dealer standing behind a gate. That’s right, a blackjack dealer standing behind a gate. Got it? File it to your number six file. See it, before you move to the next one. Number seven, what is your file? Got it? When I say the word for “fun,” what do you picture? Whatever picture that is, file that to your number seven file. That’s right, fun to your number seven file, and use the picture that works best for you. Number eight, what is your file? File a calendar to your number eight file. File a calendar to your number eight file. Visualize that, do you see it? Okay. Go back and review the items before. What was number seven? What was number six? How about five? Four? Three? Two? And one? Got it? Okay. Now, we're almost there. What is your number nine file? What is number nine? File a room to your number nine file. This should be a room that makes you think of work. Perhaps it is your office or a computer room. Just a room that makes you think of work. This is number nine, visualize that. Get a very clear picture. Got it? Okay. Now, we are on the very last one. Number 10, what is your file? Last file in your second room, file blue prints with glue on them. That is a crazy picture but file that to your number 10 file. Blue prints with glue on them. Lock that in very vividly. Do you have it? Okay, see it. Go back and review the ones before. What was nine? How about eight? Seven? Six? Five? Four? Three? Do you have all of them? Open your guidebook to Day number 13 and see how many of them that you get. Remember that you just need to write the picture down, not the action or the file. Stop the program now. How did you do? Did you get all of them? If you didn’t, remember that it is for only one of two reasons. Either number one, you didn’t know your file; or number two, your picture wasn’t vivid enough. There is no other possible reason. Now, remember that I said this was going to be a skill that we use to give speeches without notes. This particular application was going to be a time management speech. Remember, when you give a speech without notes, you never memorize it word for word. Instead, you have brain triggers to keep you moving from one thought to the next. So what we have here is 10 brain triggers that will get us talking about 10 major points. Follow along as I show you what I mean. The next thing that you talk about was file to your number two file. What did we file to your number two file? An organizer. The word we want to talk about is being organized. After you see this prop on your file, you can go into more depth with your audience, and perhaps talk with them about using a day timer or a Franklin planner. Or getting organized, using a program where there are computers or simply a filing system at their office. Number three, what is your file? What did you file to it? A things-to-do list, right? Talk to your group about the importance of writing down the things-to-do list everyday. That way, you have a plan for the day, and the day does not simply happen around you. Number four, what is your file? What did you file to it? A goal post, right? This represents that you must set and established goals to be organized. At this point, you may mention the importance of setting goals with the deadline and clearly define objectives. Now, number five, what did we file the number five? Ants, being imported, right? This represents the word, “imports.” You are importing ants. This is a mental cue to remind you that you need to select and an importance on each item on your things-to-do list and make certain items a priority. Notice we are not memorizing every single word. Just keywords that are going to be brain triggers. Number six, what did we file to number six? A blackjack dealer behind the gate. The word we want to recall was “delegate.” We used a dealer for “del” and gate for “gate.” So we have delegate for number six. This is where you mention the importance of assigning tasks for individuals and not trying to tackle the project on your own. Number seven, what is your file? What did we file to it? We filed fun to that file. When you see this, remind your audience that it is important to set time aside for fun. All work and no play is not good. You must allocate time to let your mind relax and have some fun. Number eight, what is your file? What did we file to it? You filed a schedule. When you see the schedule, you remember that this is your brain trigger to talk about keeping a regular schedule and getting up at the same time everyday and make a routine. This will help you use your time more wisely. The next one was a special room. On this file, you are going to talk about the importance of setting aside a special room to work in. This is a place where you can go and get away from all distractions and just focus on work. What was the last one? We filed a blue print with glue on it. That means that as you review your speech and recap the highlights reinforce your audience the importance of having a plan and sticking to it. That is what the glue symbolizes, sticking to it. Now, you understand the concept of how to give a speech without notes. It is not important to memorize every word, just make brain triggers and then file them to your files. Giving speeches without notes is an exclusive skill, and one that will increase your confidence when you master it. I encourage you to concentrate on this skill. It is a powerful one. You have now reached the conclusion of day 13. You can find out more about the complete memory program here.